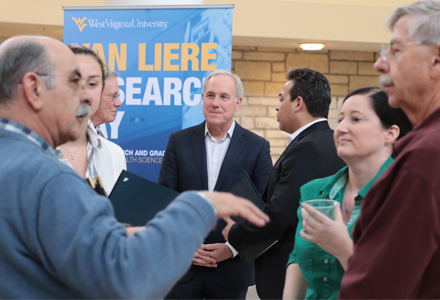 The Van Liere Research Conference was held on March 21st and March 22, 2019 at the West Virginia University Health Sciences Campus. The first event was held in 1965 to highlight the research of medical students in the School of Medicine with William A. Neal the first winner. He would later become a Professor and Physician in Pediatric Cardiology and become the founder and director of the Coronary Artery Risk Detection in Appalachian Communities Project (CARDIAC). Today, it has grown significantly to represent the research of students of all levels in all five schools at the Health Sciences Campus. This year the event was open to undergraduate students from institutions in West Virginia and surrounding state to present their research. 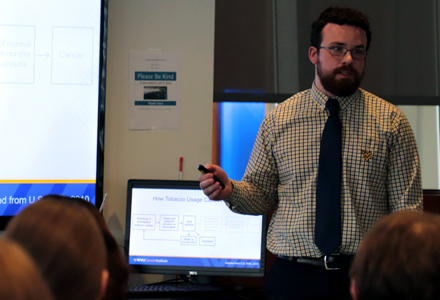 The WVU Cancer Institute was represented by 28 students with posters and flash talks. Students are clinical fellows, graduate students, and medical students. The Van Liere distinguished guest speaker was David Brailer, MD, Ph.D.
Dr. David Brailer was the featured speaker at the Van Liere Research Conference. Dr. Brailer is a leader in entrepreneurship in health care specifically in the use of health information technology. He is currently the Chairman for Health Evolution, an education and research firm in San Francisco, CA. Dr. Brailer was appointed by President George W. Bush as the nation’s first National Coordinator for Health Information Technology, or most notably the first health IT czar, leading efforts to digitalize healthcare. In this role, Dr. Brailer oversaw development of the nation’s strategy for electronic records, information sharing, consumer empowerment and transformation of research and public health. He earned his MD from the School of Medicine at West Virginia University and his PhD in economics from the Wharton School at the University of Pennsylvania. Dr. Brailer is originally from Kingwood, WV. If you were unable to attend the event was recorded. 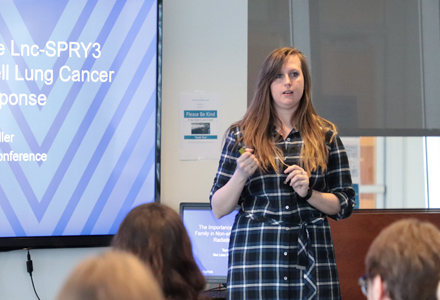 Brenen Papenberg, PhD candidate in Cancer Cell Biology presents a flash talk at the Annual Van Liere Research Conference. 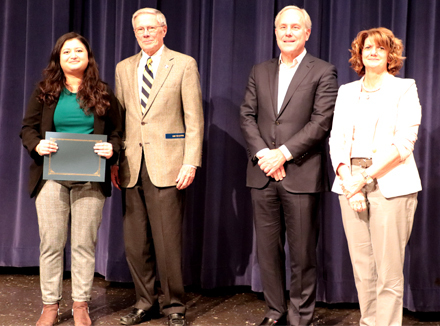 Abha Maskey a Graduate student in The WVU School of Medicine was the winner For first year graduate students. She is currently in the laboratory of Elena Pugacheva. 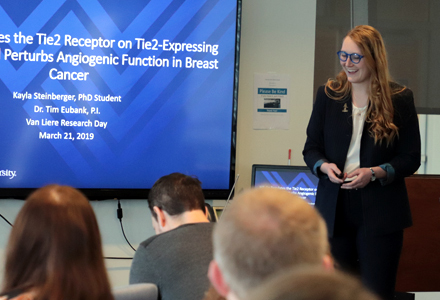 Top photo caption: Jessica Allen a student candidate in the Cancer Cell Biology PhD training program presents her poster to judges during the Annual Van Liere Research Conference. Jessica is a member of the Scott Weed laboratory. Jessica is studying the lethality and tumor invasiveness in head and neck cancers.